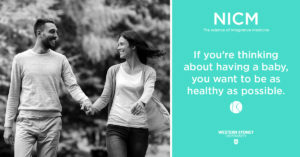 Researchers at NICM, Australia’s leader in integrative medicine research and policy development at Western Sydney University, are looking for men to volunteer for a clinical study which will test the effects of a nutritional supplement on sperm health. If you have been told that your sperm health could be better, then you might be eligible for this study. You do not need to be actively trying to conceive to volunteer for the study.